Feelings: Although severely lactose intolerant, RB and I occasionally enjoy Ben and Jerry's with handful of Lactaid. My favorite flavors are Fossil Fuel, Karamel Sutra, Phish Food, and Stephen Corbert's Americone Dream. Our neighborhood bodega named "Yankee Deli" on 30th ave in Astoria has quite an impressive stock of Ben and Jerry's, and we must have spent fortune buying ice cream and beer there. We are known as "The people who are on beer and ice cream diet." Possibly because of us, they always stay well stocked on Ben and Jerry's new flavors such as Mission to Marzipan, which was average despite my love for marzipan. 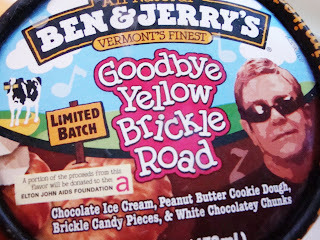 Another new flavor we tried was Goodbye Yellow Brickle Road. First of all, how can you deny Elton John when he stares at you from beyond the freezer? This is how I became obsessed with Stephen Corbert's ice cream. I love the combination of peanut butter cookie dough and white chocolate chunks with chocolate ice cream in Sir Elton's iced treat. 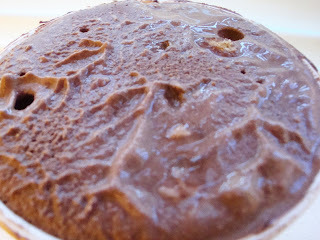 It tastes creamy and nutty, and it takes you to the ultimate chocolate heaven. The Brickle candy pieces ruin the creamy texture, and I really wish they left it out. (Although then the title wouldn't make much sense.) Such is the charm of Ben and Jerry's: you can always avoid the pieces you don't want and dig for all the chunks you love. It's a bit like life really, in a tasty little pint. mmm! (marzipan?! yumm!) should NOT have read this post at 1am. the Elton John one sounds GOOD. dammit. Dang! You're right. I'd google this definitely. I wish I blogged this. Swap?